In part two of our interview with Emma Pooley, the former World time trial champion continues to reflect on the end of what she felt was a disappointing season. The Cambridge graduate, who is taking a step down in 2013 to allow herself to concentrate on finishing a PhD in geotechnical engineering also vented a little of her frustration over the state of the women’s sport. Having just missed out on the medals in the World championship time trial in Limburg, Netherlands - finishing just eight seconds behind New Zealander Linda Villumsen in third place - Pooley was going to be one of the names to watch in the road race four days later. Unfortunately for the British rider however, she was unable to follow the race-winning move from home rider Marianne Vos, as she jumped away from the peloton on the Cauberg climb with just over two laps to go. Much of Pooley’s inability to follow Vos’ move was down to the fact that, just as the Dutchwoman jumped, her teammate Annemiek van Vleuten blocked Pooley’s path; this is not an excuse that the British rider prefers to use, however. “There was a Dutch rider that was deliberately, obviously, trying to get in the way, and then an Italian, who was just behind me and almost rode into me,” she explained. “There was just a little, half a second of ‘I can’t get out’, even though I was right in the right place; I mean that didn’t help, but when I did go, I didn’t have the legs to go with her, and [Italian Elisa] Longo Borghini did; one other rider did go with her, so it wasn’t like extremely impossible, it just wasn’t possible for me! Pooley finished the race in a disappointed 15th place, in the middle of the first chase group, and was almost in tears as she told the BBC that she felt that she had let everybody down. Having criticised both the UCI for holding the women’s side of the sport back though, and Team Sky for not putting its support behind the British women, surely its cycling that has let her - and her teammates - down. With many of her male British teammates commanding multi-million pound contracts, its hard though, for Pooley to stay silent as women’s cycling continues to struggle for its very existence. 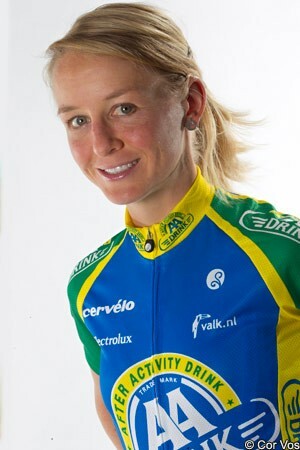 Both of Pooley’s last two teams have folded at the end of the season; in 2011, an 11th hour decision was taken by the management of Garmin-Cervélo that the team couldn’t afford to support the women’s roster; most of the riders were picked up by AA Drink-Leontien.nl - with the Garmin team continuing to meet its contractual obligation to pay their 2012 salaries - but this team too has folded as the longterm supporters of the women’s sport walk away. “I shouldn’t complain about it, but I think what’s galling is the amount of money that gets thrown at men’s cycling,” he said, “which then turns out to be riddled with... they’ve still got drug-taking issues that taint the whole sport, and give us all a bad reputation, when there’s just not enough money to go around in women’s cycling; I just feel that that’s just annoying. There are some in the women’s sport that feel that the International Cycling Union (UCI) should force all of its top level ProTeams to field a women’s roster - as Lotto-Belisol, Orica-GreenEdge, Rabobank and Skil-Shimano do - but many take the opposite view. Forcing disinterest sponsors and management teams into supporting women could see the riders short changed, while there are so many passionate people working in the women’s sport. “There are lots of teams, and lots of people, that really are interested in women’s cycling, and are passionate about it; and they’re trying their best,” Pooley agreed. “I think it will happen, but it just takes a bit of a fight. Surprisingly, there is relatively little whinging coming from the women’s side of the sport, despite the fact that most feel marginalised and ignored. Sometimes though, Pooley feels that it is necessary to put her views across. “I don’t want to come across as negative, but someone’s got to talk about it,” she said. “It will change, but… I mean, I don’t want women’s cycling to end up like men’s cycling, with the problems they have! Many of those passionate, hardworking teams, working on a shoestring budget, were the ones approaching Pooley in the second half of this year as she sought out a team that would fit with her PhD studies this winter. “I’ve noticed, the teams that I’ve spoken to at the end of this season, for 2013 - and, unfortunately, I didn’t feel that I could go to one of the big teams because I don’t think that’s the kind of year I can do next year - they really care; that’s why they’re doing it,” she explained. Much of the problems that women’s cycling faces in trying to attract financial support is the lack of media exposure that it gets, even compared to that of men’s cycling. 2012 was a golden summer for sport in the UK, with the women’s Olympic road race one of its highlights, but this - along with the World championships - was the only road race to feature mainstream media coverage. “I think the other thing I noticed this year, when spectators get to watch a women’s road race, how exciting it is, how excited they are about it, and how interesting it is,” said Pooley. “That’s what really annoys me: the basic equation is that racing is entertainment, and should be entertaining. “The argument I’ve heard a lot over the years, is that women’s racing is really slow, and you don’t race very far, and it’s boring, and a lot of women riders are really fat and slow, so no one wants to watch it because its just dull. For the sport to grow properly, Pooley feels, it needs more exposure like this. “Why isn’t it on television more often?” she asked. “Because everyone who watched it on TV for the Olympics was excited, so why aren’t all our races on television? It would do so much for the sport, as it makes it so much more attractive for sponsors basically. “It would get young girls into it, because they’d see it and there’d be people racing and having fun, and they’d want to do it too,” she added. Beating Lance in her debut marathon - in a blizzard! There were a number of rumours and theories as to what Pooley would be doing in 2013, ranging from walking away from sport altogether, to switching to triathlon. Much of the latter theory was down to the fact that she ran a marathon on October 28th. “I ran the Lucerne marathon a couple of weeks ago,” she explained. “It was a funny story; my old flatmate Abby does Iron Man, and she persuaded me to go along and do it, just for fun - in inverted commas - because I wasn’t doing a lot in the off season. I was like ‘noooo... I don’t want to do it’, as I’d only been running for a couple of weeks; I didn’t want to injure myself. For a first marathon however, conditions in the central Swiss city were less than ideal. “There was a blizzard as well,” said Pooley. “It was definitely an interesting first marathon! I wished I’d worn a cap, because I kept getting snow in my eyelashes and I couldn’t see properly! It was so cold, and I never normally run in tights, but it was really fun! Pooley’s time, of 2 hours 55 minutes 35.8 seconds proved to be four minutes faster than that of Lance Armstrong, who made his marathon in New York in 2006, shortly after having temporarily retired from cycling. While Emma Pooley will ride a far more low-profile calendar in 2013, with her new Swiss team Bigla, she will still be aiming at the World time trial title in Florence, Italy. With a year to finish her PhD and rekindle her passion for the sport, we sincerely hope to see her back at the top of women’s cycling in 2014. Click here to read part one of our exclusive interview with Emma Pooley, where she explains her decision to sign for Team Bigla, and looks back on 2012.